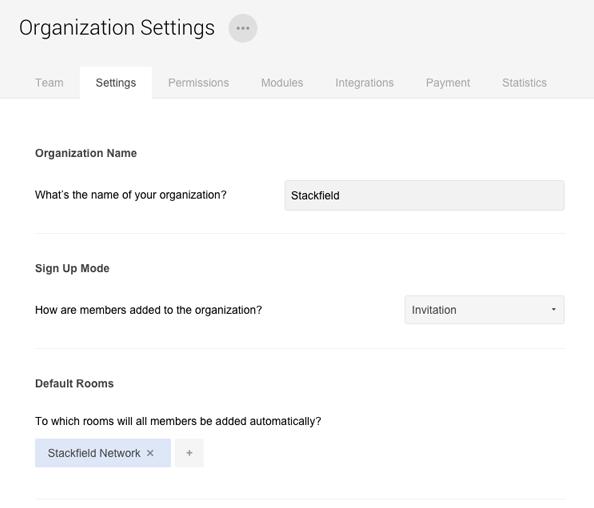 On Stackfield, organizations are used to controll the internal guidelines and permissions for accessing data rooms. At the same time, all team members are managed throuh an organization. 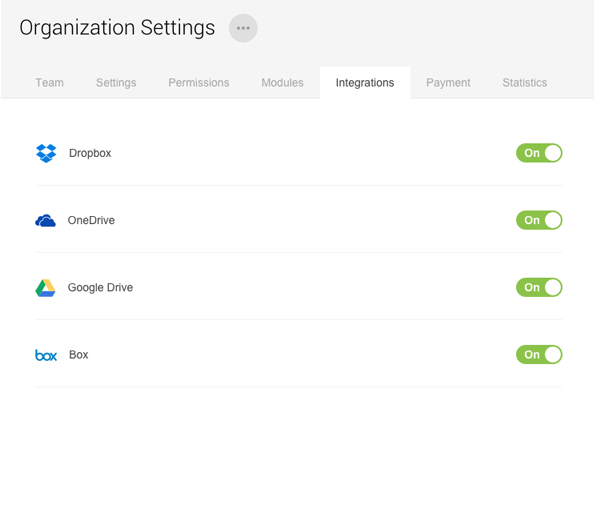 As central part of the organization, your team is displayed directly after opening the organization settings. The team members are divided in the categories "Members", "Restricted Guests", "Deactivated" and "Invitations". The search allows you to filter the users of the organization. 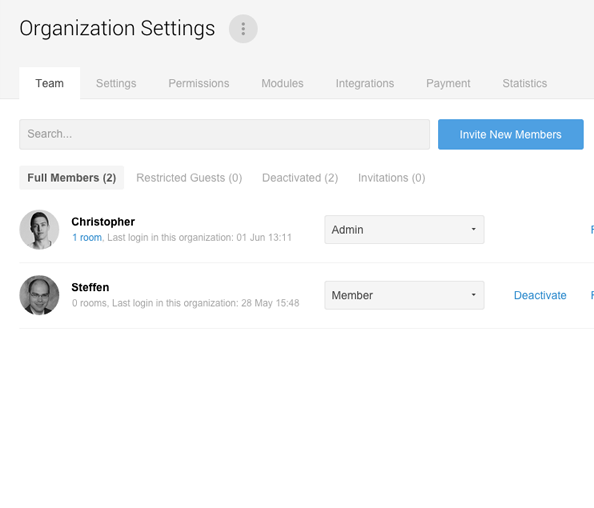 Add new users to your organization by clicking on the button "Add New Member". Overview of all users contained in the organization. The instructions for adding a new member can be found here. Keep in mind that you need to purchase enough licenses before new active members can be added to the organization. 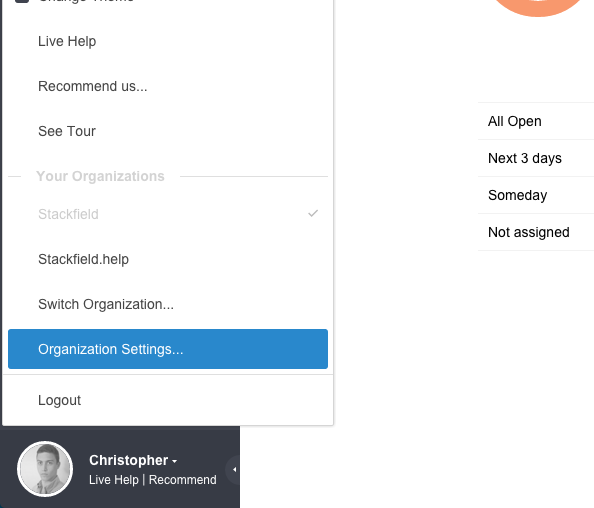 Adjust the basic settings of your organization in the tab "Settings". In addition to the name of the organization, you can set a new logo, which will be displayed to all members of the organization. It is possible to choose between two different sign up modes: With the first option, you are only able to add new users by sending an invitation. The second option adds new users automatically to your organization if these users have a specific domain within their email address. These domain can be determined freely. 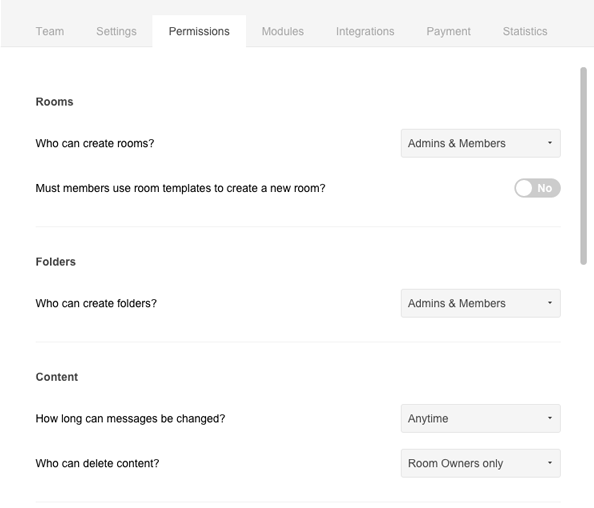 With the feature "Default Rooms" you can define rooms, to which new users shall be added automatically if they join your organization. Organization offer extensive possibilities in terms of meeting compliance guidelines and allocating rights. These rights can be set individually for all features. Therefore it's possible to define who is allowed to create new data rooms or to edit / to delete content. Likewise you can detemine who is allowed to add new members to the organization. Furthermore, you can decide whether all rooms and direct messages need to be encrypted, and who is authorized to create unencrypted rooms. Permissions help in complying with the internal compliance guidelines. 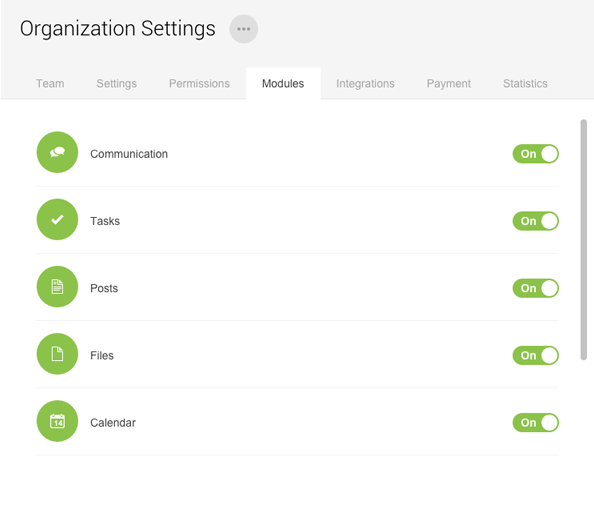 By clicking on "Enabled", modules can be disabled for the entire organization. Deachtivated modules can't be used in any data room. Modules can be controlled globally. The integration of external services can also be regulated if an available service is not compatible with the compliance rules of the company. The use of integrations is controlled centrally. You can choose between two different plans, depending on your needs: The Starter and the Business plan. The number of included users shows how many admins, members and guests can be invited. For Externals, however, only half a license is needed. After having chosen a plan, you are able to decide if you want to pay monthly or yearly. 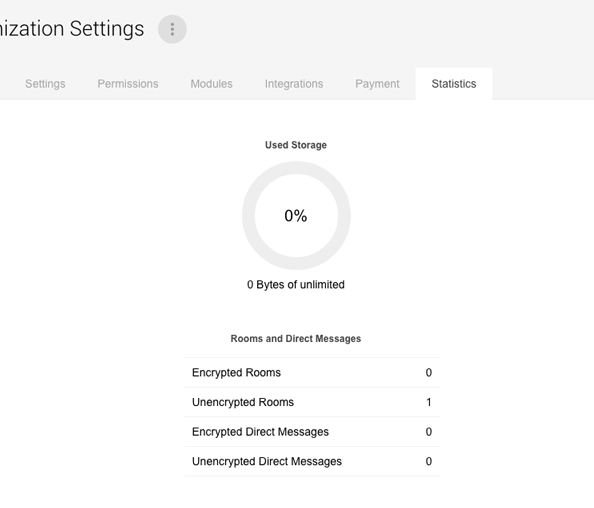 The statistics provide information, such as the number of encrypted / unencrypted data rooms and direct messages within the organization, at a glance. Additionally you can see how much storage space is available. The statistics provide information about the distribution of encrypted and unencrypted rooms.